The Grand Canyon University speech and debate team is making an argument to be considered among the best of its kind in the U.S., considering some of the universities it has beaten at tournaments this fall. The team, led by communications instructor Barry Regan, earned another first place over the weekend at the Pacific Southwest Collegiate Forensics Association’s Fall Championships Tournament at Mt. San Antonio College in Walnut, Calif. 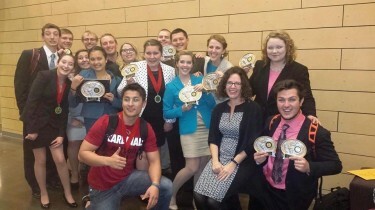 The event is considered the largest collegiate forensics competition in the West. That marked the fourth time this semester the students have earned first-place honors at major collegiate competitions designed to help young people hone their public-speaking skills. GCU’s squad finished first in the individual events sweepstakes and second place overall. Teams from UCLA, USC, Azusa Pacific University and Biola University — plus those from top-ranked speech and debate schools such as the University of Utah, Eastern Michigan University and California State University, Long Beach — were among the more than 40 finishing behind GCU. “Given the size of this tournament, and the level of competition we faced, I couldn’t be more proud of how we performed,” said Regan, who is in his second year as a GCU instructor and director of the 15-member speech and debate club. “At this tournament last year we took fifth place, so it demonstrates just how much our team has progressed,” Regan said. GCU student standouts included Zachary Kuykendall (gold medal in varsity International Public Debate Association debate) and sisters Victoria and Chloe Saunders (first place in varsity duo interpretation). Students JilliAnna Davis, Emmett Foster, Thomas Rotering, Ashlyn Tupper and Bradlee Waldraff earned Top 5 places in several other events, including extemporaneous speaking, persuasive speaking and parliamentary debate. In November, the team finished in first place, ahead of teams from Arizona State University and Northern Arizona University, in individual events among four-year universities at the Grossmont College-Griffin Invitational in California. Also last month, it hosted a public debate with ASU student speech and debate club members at GCU’s Student Union. Two GCU students argued the likelihood of the Republican Party retaking the U.S. Senate majority in last month’s elections, while ASU’s duo argued why Democrats would retain control. The public debate was well attended and helped generate attention for the club, which has evolved rapidly since its origins in GCU’s former College of Arts and Sciences. The club now is part of the new College of Humanities and Social Sciences, though students have a range of majors, rather than just the communications program or other humanities programs. Rotering, 19, a sophomore biology pre-physican assistant major, said he got involved with GCU speech and debate to sharpen his public speaking and analytical skills. Last year, students such as Jasmine Richardson, who has since graduated, earned more honors in speech events. Richardson won awards for her passionate prose interpretation of the harrowing autobiography, “Left to Tell: Discovering God Amidst the Rwandan Holocaust,” by Immaculée Ilibagiza, who survived the 1994 genocide in her native country by hiding for 91 days in the bathroom of a local pastor’s home. The results of last weekend’s competition in California showed GCU’s team is expanding its range. “It was a really big win for us,” said Rotering, who also earned a judge’s honor for eloquence in debate. As a duo in parliamentary debate, he and Kuykendall responded to challenging subjects related to foreign affairs, such as military interventions in the Middle East and other global conflicts. Rotering said addressing issues such as the Affordable Care Act during competitions has helped expand his knowledge of complex issues that likely will impact his career. In debate events, students often are challenged to defend a position that might not match their personal beliefs and to debunk others, through prepared or impromptu styles. “It’s really increased my education about different people and the perspectives they have,” Rotering said.